Euclid Records is more than just a record shop. It is a link down the river to New Orleans, where it has a second location and a big pair of open arms for any bands from St. Louis headed toward the Gulf of Mexico. And Euclid isn't just selling recordings made by other people — its proprietors also run a music label that's home to a few of St. Louis finest bands past and present. But let's not overlook Euclid Records' storefront, either, which is defiantly spacious in a time when record stores around the country are fighting for every square foot of their lives. 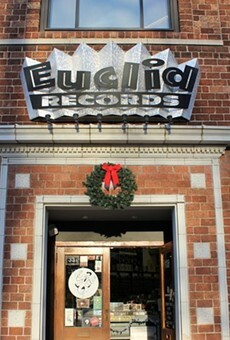 Euclid uses the area it has to stock a music fan's dream variety of obscure gems and instantly recognizable hits, including the the largest collection of vinyl this side of the musty hillsides in Record Exchange.